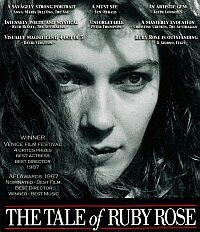 Working as a wilderness advisor on The Tale of Ruby Rose (Tasmania, Australia) a feature film directed by Roger Scholes, was both exhilarating and satisfying. Roger spent many years developing the film, and was deeply passionate about the project. His energy and enthusiasm was contagious, although the production budget was quite small and everyone went the extra mile to make the film happen. 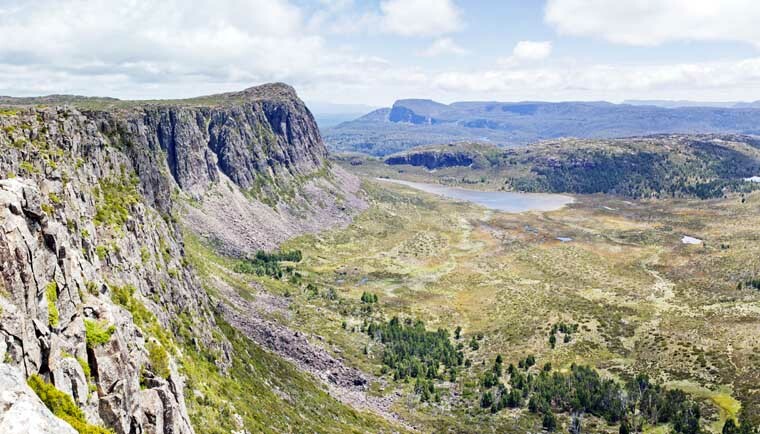 The majority of filming took place in the Walls of Jerusalem National Park, with many other locations including Roses Tiers and Ben Lomond National Park. The main cast consisted of Melita Jurisic, Chris Haywood, Rod Zuanic, Martyn Sanderson, and Sheila Florance. I was Sheila’s driver and she has since left us but I spent a couple of wonderful evenings over dinner discussing her early years in English drama and she was an absolute delight to chat with. The production company had intended to use helicopters to transport everything to the remote wilderness locations. A great deal of equipment, including prefabricated sets was intended to be moved by chopper, however by mid-winter heavy snowfalls made flying hazardous and intermittent. As a local Taswegian this is precisely the scenario that I had presented to the production company… that is to rely on choppers was as grave mistake. The piston engine chopper below came in within the first few days and was pretty much snowed in for the duration of the shoot. It was at this point that I was employed as a wilderness advisor. Prior to winter conditions really settling in, helicopters were able to fly in most of the prefabricated film set, heavy film equipment and the accommodation units (plus animals, including a cow). A small piston engine chopper hired to carry cast, spent most of the shoot grounded and covered in snow. Accommodation in this instance is another name for a garden shed. Wooden bases were built and the garden sheds erected, and lined with polystyrene sheets, which were surprisingly warm. The sliding doors often froze solid overnight, and with little hot water available, piddling on the slide was sometimes the only way to get out. This task was obviously easier for the men, and girls could be heard hollering in the mornings, ‘could someone please open my door’, man with a hose was necessary. As a result of deteriorating weather conditions, experienced walkers were engaged to carry supplies and essentials, which provided a lifeline to cast and crew. During the period filming in the Walls of Jerusalem I completed 23 return trips in and about of the Park, packing in food, fuel, film stock and rushes. Some days I did two return trips, one night getting into camp around 9pm in near blizzard conditions. Part of my job as wilderness advisor was to guide cast and crew in and out of the Walls, and organise up to a dozen walkers to carry in equipment and supplies. The cast or crew had little experience working in wilderness environments, or living in alpine conditions with few amenities. The safety briefs, education and commonsense of staff paid off, with only one incident over the three week period. This slip-up occurred when the Producer (Andrew Wiseman) decided he wanted to walk out and missed the afternoons guided trip (The walls had no duck boarding in 1986). He left the camp in whiteout conditions, became disorientated and couldn’t find his way out. Somehow he staggered back into camp, and amazingly was changing his clothes (putting pants on back-to-front) to go out again. Obviously suffering from hypothermia, the camp manager a ski instructor insisted the producer climb into bed. This is my end of the story but of course there where many other Tasmania’s involved and will have other yarms to tell. The Tale of Ruby Rose – What Is The Film About? “Ruby Rose (Melita Jurisic) is an Australian woman living with her Welsh immigrant husband Henry (Chris Haywood) in the Tasmanian highlands. Cut off from her judgemental family, for whom Henry once worked as a farm hand, Ruby remains isolated in her tiny house. Superstitiously terrified of the dark, she begins developing her own folklore about the inky blackness that surrounds her each night; this folklore eventually develops into Ruby’s own personal religion, created to ward off the evils she imagines lurk in every corner.” Description sourced from Screen Tasmania. The production company in conjunction with Tasmanian National Parks implemented a Minimal Impact strategy for the three months of filming. Due to the fragile alpine environment and production personnel living on location, National Parks levied a $20,000 bond for the period of filming. As a result of the strict controls, careful planning, and extensive cleanup operations the bond was fully refunded. As a wilderness advisor I was happy with the outcome, and believe the environment was minimally impacted upon by the filming activities. Eighteen years later, and with experience gained from this production as a wilderness advisor, I managed Through My Eyes, for the Department of The Environment and Heritage. This was a drama documentary produced by Liberty and Beyond on the life of Lindy Chamberlain, and shot in the iconic Uluru Kata Tjuta National Park.